Back Row: Coach Cameron Blankenship, Coach Sydney Shelton, Grayce Edwards, Kyra Leonard, Coach Sam Edge, Coach Tom Houser, Emma Janney. Middle Row: Ellena Williamson, Rylee White, Rosie Giles, Emma Montgomery, Isabella Alvarez, Emily Butts, Emma Patterson, Mattie Andrews. Front Row: Peyton Bower, Grace Duty, Anna Williamson, Jenna Hamilton, Carley Fix. The STAR Division for girls with significant experience, grades 8 - 10! The Shooting STARS division is for girls or boys with intermediate levels of experience, grades 6 - 8! The 2016 registration form is here. Members Of The RCS Team! You will get to see if you have the skills of the Division III State Champions from 2011, 2012 and 2013! The maximum number may be 20 in each division! However, if the numbers get bigger, more coaches will be hired to maintain the 1:4 coach/camper ratio. Sam has completed two seasons on the volleyball team at UVa-Wise! She graduated from Roanoke Catholic School where she was a part of their 3-peat state championship! In the past 2 summers, Sam has helped with 6 STAR camps and this past summer helped prepare the Roanoke Catholic team for their fall season! She played club vball for 5 years in Roanoke, Va. You can reach Sam at SamEdge29@gmail.com! 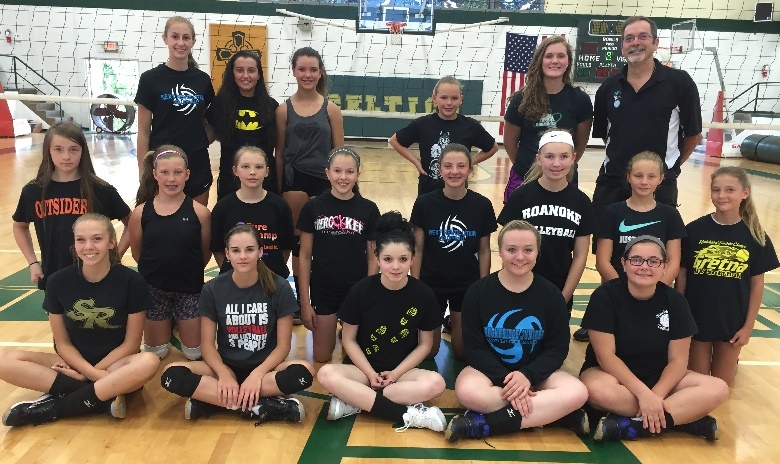 Is there any other camp where approximately 20 girls will have be able to work with up to five coaches & assistants? If you have any questions about the camp, you may email the camp director, Coach Houser at coachhouser@yahoo.com, or the camp host, Roanoke Catholic head volleyball coach Amanda McCoy at AMcCoy@RoanokeCatholic.com. "Thank you so much for inviting [my daughter] to camp. She really enjoyed the coaches and the girls. She said they all hit it off from day one, and it was a great experience. She made many new friends, and loved the coaches! Again, thank you for all you have done for her. She loves working with you!" "Just wanted you to know my daughter said she had so much fun and learned so much this week at camp. Thx!!"